Handcrafted or machine-made. Area rugs are beautiful works of art. But these are works of art that are made to be walked on. In fact, the more you walk on a well-made rug, the better it looks. As you walk on your rug the layers of pile will start to break resulting in a shinier, smoother appearance. A good quality area rug is not easily damaged and with proper maintenance and cleaning, your area rug will be a beautiful, comfortable enhancement to your home for years to come. 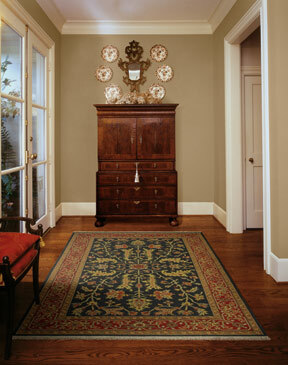 Maintenance is simple: vacuum or sweep your rug as you would wall-to-wall carpeting. Just be careful that the fringes don’t get pulled or sucked in by the vacuum cleaner. Is your rug in need of some serious TLC? Let the experts at Kermans help. At Kermans we specialize in treating delicate rugs of all kinds including Orientals, Silks, Machine-Made, Antique and all other Handmade rugs. Each area rug is treated individually with special attention and care for proper cleaning and the best results possible. At our state of-the-art cleaning facility, we determine the best cleaning technique and method that suits your rug's particular weave, fibers and dyes. Our expert technicians extend the life of your rug and protect your investment with cutting edge processes that deep clean and revive the colors of your rug. Our trained team can also pick-up and deliver your rug for an additional fee, dependent of travel time and furniture moving requirements. Learn more about our Area Rug Cleaning Services. Bring in this page and receive 20% off your next Area Rug cleaning, repair or purchase. Kermans has the widest selection of area rugs in Central Indiana. Stop by our Castleton showroom to see the different sizes, styles and manufacturers available. Don't see one that's just right? Let Kermans craftsmen create a one of a kind rug just for you! It can be a very affordable solution to your design needs. We are also able to cut, bind, serge and shape regular carpet into a custom rug just for you. Our Design Consultants will work closely with you to make a quality rug that is truly just for you. Put our 88 years of experience to work.